There are a few notable things about Disney’s classic Dumbo animation film from 1952. One of the biggest things is that it now seems completely dated, with uncouth stereotypes and animal captivity in the circus. The other big thing – well, small really – is that it is only 64 minutes. A nice somewhat charming tale that comes in just over an hour because that’s all it truly needs to be. Tim Burton manages to adapt and change all of that for his latest movie spectacular. After a run of poorly-received films such as Miss Peregrine’s Home for Peculiar Children and Dark Shadows, is Burton back on top with Dumbo? The big top? As family adventures go, Burton has crafted a film that has a lot of imagination. The great world of vintage circus is on display with glorious outfits and timely set pieces. 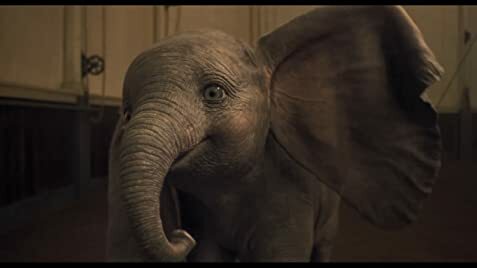 The titular animal is crafted by an elephant performer and CGI and the result is magical – making Dumbo absolutely adorable with big blue eyes that you cannot help but root for. There is a lot of emotion here and the melodious scene of Baby Mine still pulls at your heart-strings as much as the classic did. The problem is that even with the colours, sights, and sounds, there is still this incessant Burton drabness that dilutes the proceedings. Plus, the original is an hour long – just over. Trying to stretch that film into a two hour story is ambitious, and it doesn’t work. If anything, it just slows the movie down. The climax should be Dumbo figuring out he can fly and does so outstandingly in front of an audience. It’s the classic story but that’s why it works – it’s all about Dumbo’s self-believe in the face of bullying, and adversity. Instead, Burton changes the message. He does all his flying work in less than an hour and is taken to a Coney Island funfair to be the main attraction. Soon the film changes tone and tempo to become a escape film that warns of the moral implications of keeping animals in captivity for entertainment. It’s somewhat admirable that Burton would focus on this but it doesn’t quite fit the movie or momentum, causing it to drag in places. With Dumbo, there is more heart in here than most of Burton’s latest releases and that works to keep you entertained for the runtime. Colin Farrell makes a compelling Dad (and a very hot clown,) whilst Nico Parker and Finley Hobbins are charming children to root for. Dumbo just gets sloppy and it is an unnecessary outing. Go, however, purely for the adorable elephant!